The Band's Ultimate Live Album Recorded at Its Career Peak! The Last Waltz gets bigger billing, but The Band’s 1972 live album Rock of Ages is actually the better representation of a live Band album. Recorded at the tail end of the group’s Cahoots tour and over the course of four nights at New York’s Academy of Music at the end of December 1971, the incendiary concert set bookmarks the close of the first phase of the collective’s career. Rather than follow the lead of most other live records made at the time (and many since), The Band resists any temptation to improvise or extend its material. Instead, the group plays with an intensity, chemistry, and spirit that’s nearly unrivaled by any other live album. The quintet also draws on a secret weapon: One Allen Toussaint, who tailors expert horn arrangements for multiple songs, a move that spices renditions of classics such as “Don’t Do It” and “Chest Fever.” To top it all off, the horn charts are performed by the Rock of Ages Horn Section—a five-piece ensemble that includes legendary trumpeter Snooky Young (Count Basie, Lionel Hampton) and saxophonist Joe Farrell (Charles Mingus, Elvin Jones). Do they ever. Unencumbered by the myriad guests and grandiose sense that define The Last Waltz, and energized by Toussaint’s invaluable work, Rock of Ages is the sound of a great band pulling out all the stops. Robbie Robertson’s guitar solos take “Unfaithful Servant” to a higher ground; “The W.S. Walcott Medicine Show” kicks with raunchy R&B abandon; Garth Hudson delivers a show-stealing performance on “The Genetic Method,” a thrilling organ piece that incorporates elements of Anglican church music, folk, classical, and pop—as well as “Auld Lang Syne,” due to its being recorded on New Year’s Eve. 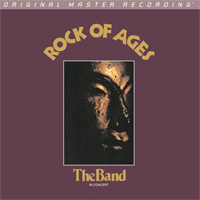 After various inferior editions and reissues, Rock of Ages is finally presented on an immaculate-sounding 180g 2LP set from Mobile Fidelity that lets Toussaint’s contributions, horn section’s energy, and the Band’s feverish interplay shine like never before. Mastered from the original tapes, the open, airy, natural, and balanced sound will have you returning to Rock of Ages again and again. "Live albums tend to gloss over the depth, mystery and emotional intensity found on studio versions of the same songs, particularly when the group speeds things up to cover its inability to produce the desired results live. Here, The Band slows everything down, producing even more intense, deliberate and emotionally satisfying versions of familiar songs. Each play reveals more gems hidden within the musical folds. Be sure to crank it up! " - Michael Fremer, www.analogplanet.com, Music 10/10, Sound 8/10! • 1/2 Speed Mastered from the Original Master Tapes!